The last official day of the school holidays and I had planned to go into school to continue on from all the work I left strewn out as I tidied and rearranged the furniture yesterday. But instead I decided to spent it at home, just pottering about. 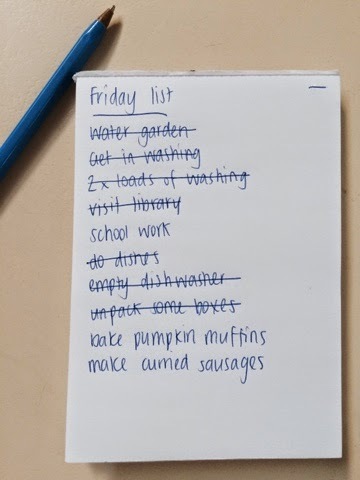 History says that the last day of school holidays is generally a good day for getting stuff done around the house because I am procrastinating from all the school work I should have done over the break. Once again it proved true, which was handy because the poor house has been a bit neglected of late. Yes, one of those items on the to do list is unpack more boxes, because I still haven't finished unpacking everything. Feeling so sick with morning sickness as I moved out to the country and having problems with dizziness and low blood pressure meant not a lot got done. I did manage to sneak in a short amount of time doing a bit more knitting though. 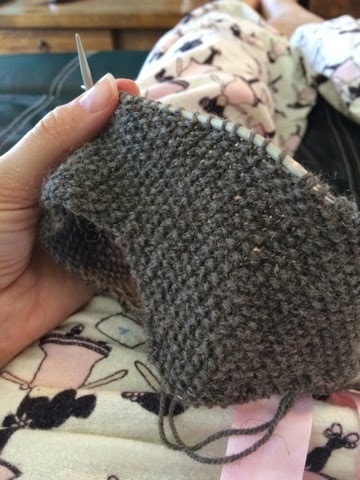 This is the beginnings of a baby beanie with ear flaps for my best friend who is due in June. The pattern is from Patons booklet 8000 and looks very sweet in the picture but I have decided I'm never doing moss stitch in 4ply again, it seems to be taking forever and growing at a very slow rate. Fingers crossed it actually fits! I'm making it in the 3 month old size so it should do. I'll head into school tomorrow to finish getting ready for Monday while MR is at work. It's seeding time out here which means everyone needs/wants tyres changed on their farm equipment and of course, his tyre fitter has just quit. No relaxing pottering weekend for him.